Highway agencies spend millions of dollars to ensure safe and efficient winter travel. However, the effectiveness of winter weather maintenance practices on safety and mobility are somewhat difficult to quantify. Phase I of this project investigated opportunities for improving traffic safety on state-maintained roads in Iowa during winter weather conditions. The primary objective was to develop several preliminary means for the Iowa Department of Transportation (DOT) to identify locations of possible interest systematically with respect to winter weather-related safety performance based on crash history. 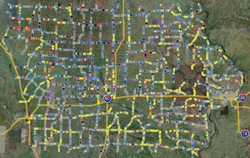 Specifically, metrics were developed to assist in identifying possible habitual, winter weather-related crash sites on state-maintained rural highways in Iowa. In addition, the current state of practice, for both domestic and international highway agency practices, regarding integration of traffic safety- and mobility-related data in winter maintenance activities and performance measures were investigated. This investigation also included previous research efforts. Finally, a preliminary work plan, focusing on systematic use of safety-related data in support of winter maintenance activities and site evaluation, was prepared.